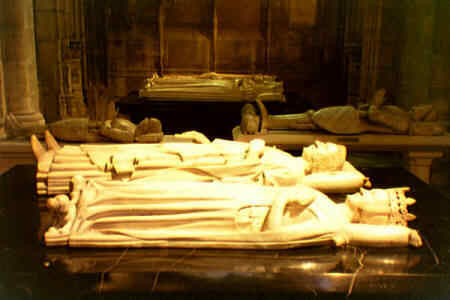 It was in the years 1137 to 1144, under the reign of Louis VI le Gros and Louis VII le Jeune, that the powerful royal conselor Abbot Suger conceived and supervised the rebuilding of the church of Saint-Denis. Already the burial place of Charles Martel, Pépin le Bref, and Charles le Chauve (Charlemagne's grandfather, father, and grandson respectively), Saint-Denis seemed the logical site for the creation of a symbolic center for the French monarchy. Suger's plan was to establish the authority of the still relatively weak Capetians on the tradition of the great Carolingians. 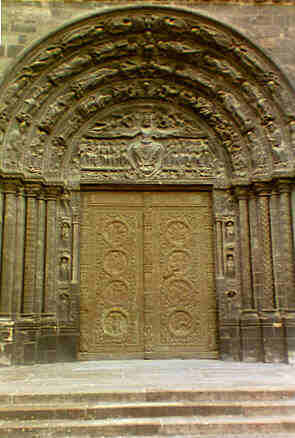 The architectural innovations of the new church centered on a quest for harmony and luminosity as yet unknown in European art. 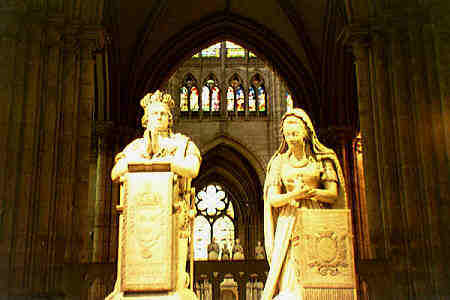 Saint-Denis thus became the first bold attempt at what we now call Gothic art, a form that would soon dominate the hearts and the skylines of the major cities whose commercial, economic, and political importance were growing with that of the monarchy. Soon construction would begin on an appropriate structure for the masses attended by the kings, Notre Dame de Paris, and then a suitable structure for their coronation in Reims (where Clovis was baptized in 496). 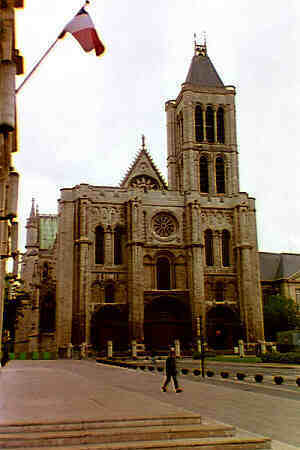 Chartres, Amiens, and the other great cities in France and throughout Europe could but follow. The new building at Saint-Denis thus became the place where the final mass for most of the French kings, and the sculptures that mark their tombs is perhaps as moving as the building where the lie. 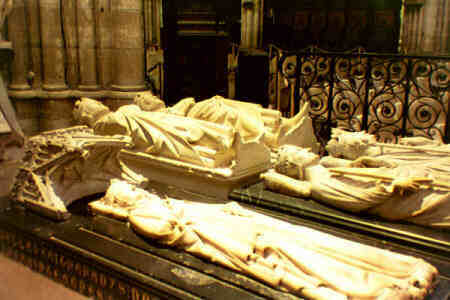 Here we see the tombs, from top left, clockwise of Charles Martel (19 Kb), Philippe IV le Bel, Philippe III le Hardi, Isabelle d'Aragon (forward) and Clovis II (beside Charles Martel). 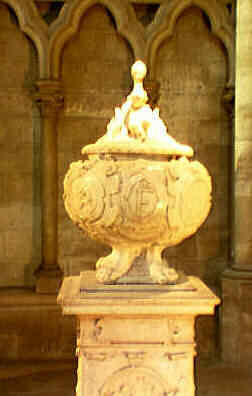 The urn here holds the heart of the great Renaissance king and builder François Ier, easily identifiable from the letter "F" that marks so many of his works. The tome of François Ier and Claude de France is in homage or rivalry with that of François's great enemy, Charles Quint, king of Spain and Emperor of Germany, whose is buried in the Escorial in Madrid. Pépin le Bref and Berthe au Grand Pied (15 Kb) , parents of Charlemagne. 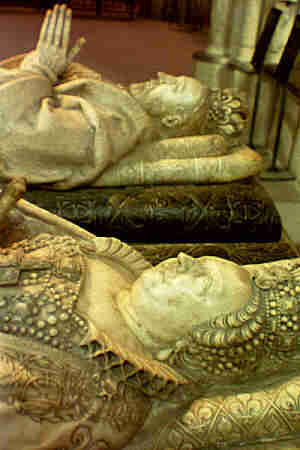 Charles VI le Fou and Jeanne de Bourbon (the unique "gisant d'intestin" in Saint Denis). My notes are vague here, but I am fairly sure that the small gisant is that of the great hero of the Hundred Years War, Bertrand DuGuesclin. Cunning and fearless in battle, he was very small in stature -- a true "little big man" -- having played a role as great as that of Joan of Arc in preventing the English from conquering France in the later 1300's. 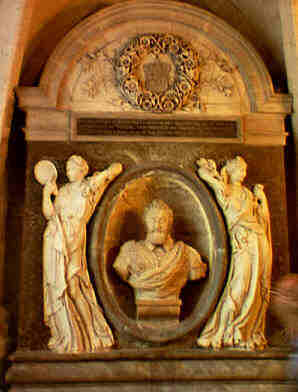 The Protestant Prince who brought peace to France after the bloody civil wars of the 1500's, Henri IV (13 Kb), married the last surviving child of Henri II and Catherine de Médicis, Marquerite de Valois ("Queen Margot") and converted to Catholicism declaring the "Paris is well worth a mass" ("Paris vaut bien une messe"), thus becoming the founder of the Boubon dynasty. A political genius, it is he coined the expression "a chicken every pot" (" une poule au pot tous les dimanches") and who proclamed the famous Edict of Nantes -- the first declaration of religious tolerance. It was with his second wife, Marie de Médicis, that the "Good King Henry" would father Louis XIII who would work with Richelieu to establish the tools with which the great Louis XIV create a system of absolute monarchy. Ironically, the grandson of the Protestant Prince would revoke the Edict of Nantes in 1685, the ending the experiment in religious freedom. The tombs of the last Bourbon kings (15 Kb) are perhaps appropriately somber. 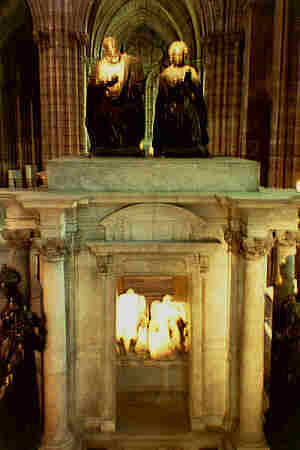 Louis XVI, beheaded in 1792, is burried under the center stone on the right. 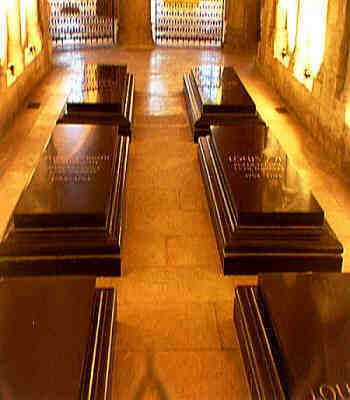 His wife, Marie-Antoinette, who met her fate the following year, is buried center left. 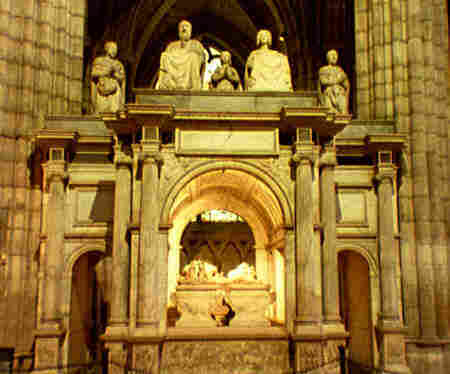 Forward right is the tomb of Louis XVIII, who reclaimed the throne after the Revolution and the defeat to the Emperor Napoleon I. The blank stone forward lain, but left unused, Charles X the last Bouron monarch, who abdicated in 1830 in favor of the "Citizen king" Louis-Philippe d'Orléans. Louis XVI and Marie-Antoinette (15 Kb) are also represented in these prayerful postures. 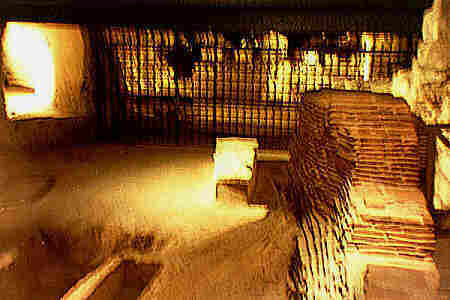 The crypt (15 Kb) underneath the church is actually the remains of the original building dating from the time of the Merovingians of the fifth to eighth centuries. 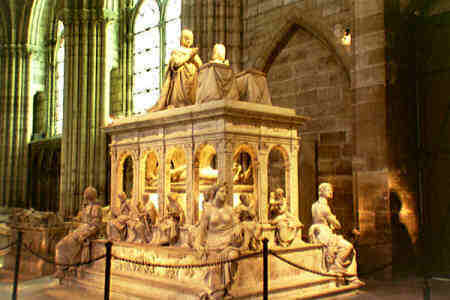 It is believed possible that the tomb of Saint-Denis himself is here. 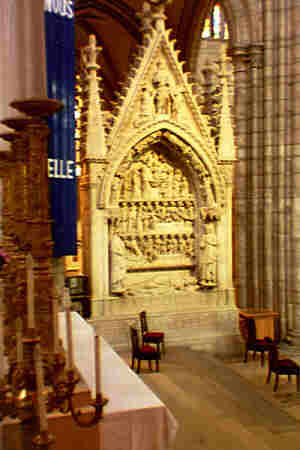 One of the great Merovingians, best remembered today in a popular 18th-century song the mocks the monarchy ("Le Bon Roi Dagobert"), is buried under this impressive monument. Dagobert I was king of the Franks from 629 to 639, and with able assistants Eloi and Ouen, both later to be canonized by the Church, he reunited a kindom that was ever threatened with disintegration. Henri II and Catherine de Médicis (also in these praying gisants)represent the last great figures of the Valois line of Capetians. The son of Francois I, Henri II died tragically in a jousting accident in 1559. Catherine would try to maintain order, but her son François II would die after a reign of only a few months (his wife Mary Stewart thus returned to her native Scotland only to be beheaded by the forces of Elizabeth I of England). Catherine's next son, Charles IX, was weak and perhaps even deranged. At first tolerant of his Protestant subjects, he soon fell under the influence of the Catholic partisans, the Guise family, and ordered the Saint Barthomew's Day Massacre that took place during the night of 23-24 August, 1572. More than 300 Protestants were killed in Paris alone, including his form friend and confidant Coligny. Henri de Navarre, the future Henri IV barely escaped the raids on Protestant houses. Catherine's youngest son, Henri III, would then come to the throne. Desirous to restore peace and order, he was prone to poor judgment and remained unsuccessful. All three of these last Valois' died childless and the stage was set for the arrival of the Bourbon pretender Henri de Navarre, husband of Catherine's daught, Marguerite (Margot). 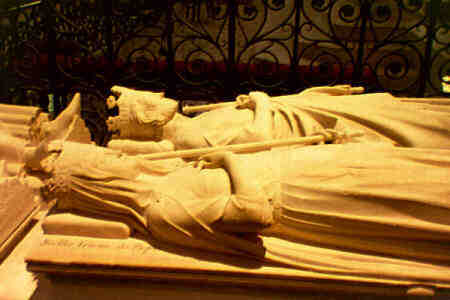 Also among the great couples of the French monarchy were Louis XII and Anne de Bretagne (17 Kb). Son of the poet Charles d'Orleans Louis XII inherited both the throne and his spouse from his cousin Charles VIII. Having himself participated in a revolt against the monarchy of Charles VIII, Louis XII would do his best to pursue his predecessor's policies, both by continuing the wars in Italy that were bringing the Renaissance to France and by maintining Anne de Bretagne's title of Queen of France (even at the price of renouncing his first wife Jeanne de France). This alliance between France and Britany would now be permanent and the power of France would now be greater than at any time since Charlemagne. The internal peace and prosperity this established, the way was set for the great accomplishments of the next king, François I.